Sometimes the car Gods smile upon you. 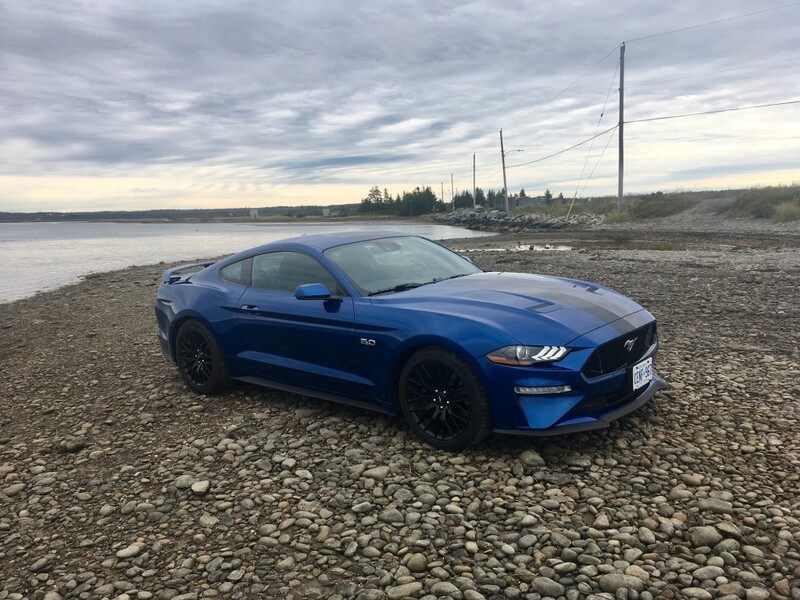 I found out that Ford Canada was finally willing to send an interesting vehicle to Atlantic Canada for review for a change. And that vehicle was a Mustang with a V8. 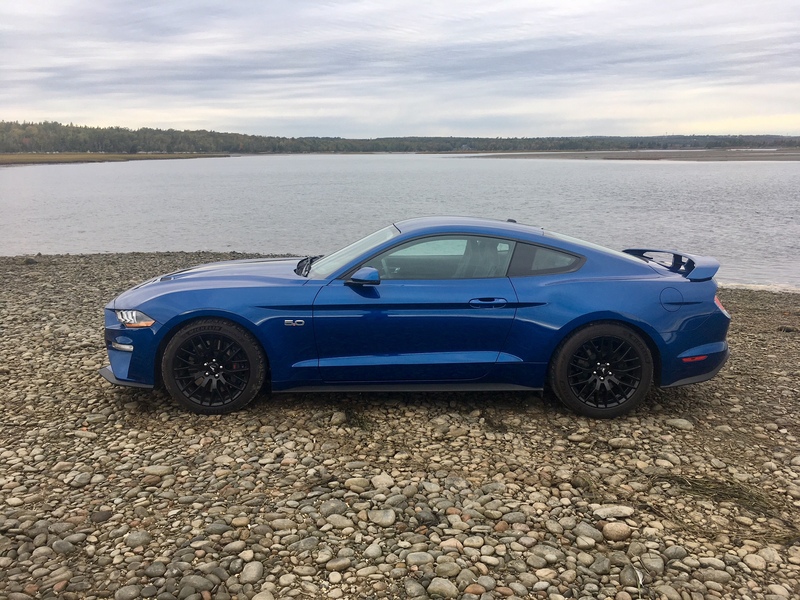 I was hoping Ford would keep the streak going by equipping it with a manual transmission, but I was told it would be the new 10-speed automatic, largely due to the fact that the Mustang was to make its rounds to local lifestyle bloggers first, and most of them apparently don’t know how to drive manual (thanks for ruining it for us actual automotive enthusiasts, guys). Still, the new 10-speed automatic promised to quite impressive and quite frankly the opportunity to drive a big rear-drive V8 muscle car for the week was appealing enough regardless of the transmission set up. I patiently waited my turn for seat time. But then, those car Gods started to frown. 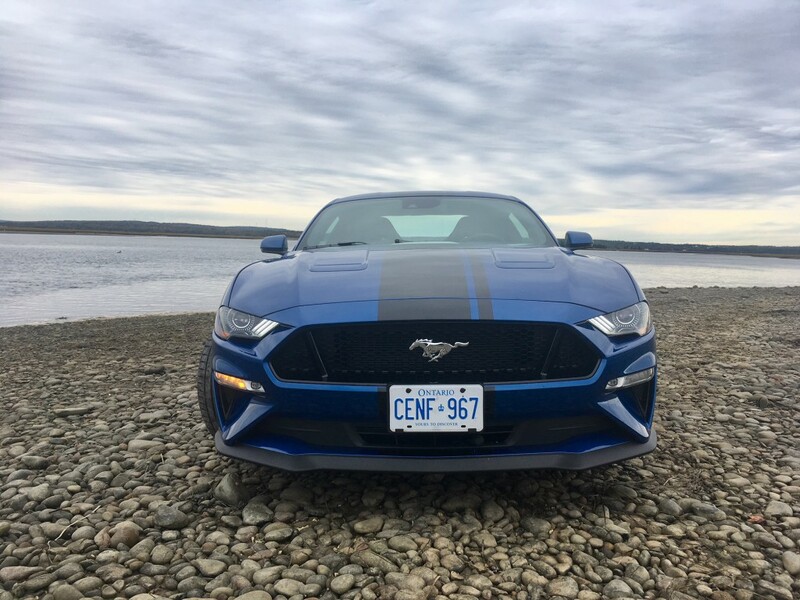 All of a sudden, I found out that Ford Canada was pulling the Mustang from the fleet early, and my originally scheduled week turned into a mere two days. Sigh. But two days are better than no days so I decided to make the most of my reduced time with it. For 2018 Ford has given some styling upgrades to its iconic pony. The headlights have been redesigned to look squinty-er, the bars on the tail lights now curve inwards slightly, and new bumpers and wheel styles are now available. It still has plenty of road presence and my tester’s lightning blue metallic with black stripe down the middle only added to its cache. 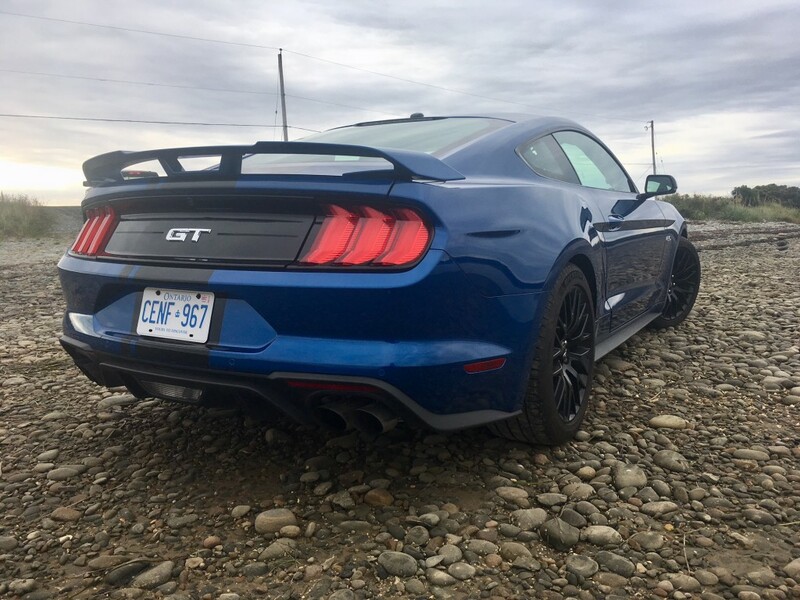 Helping even further is the GT performance package, which Ford Canada was kind enough to tick off when ordering. 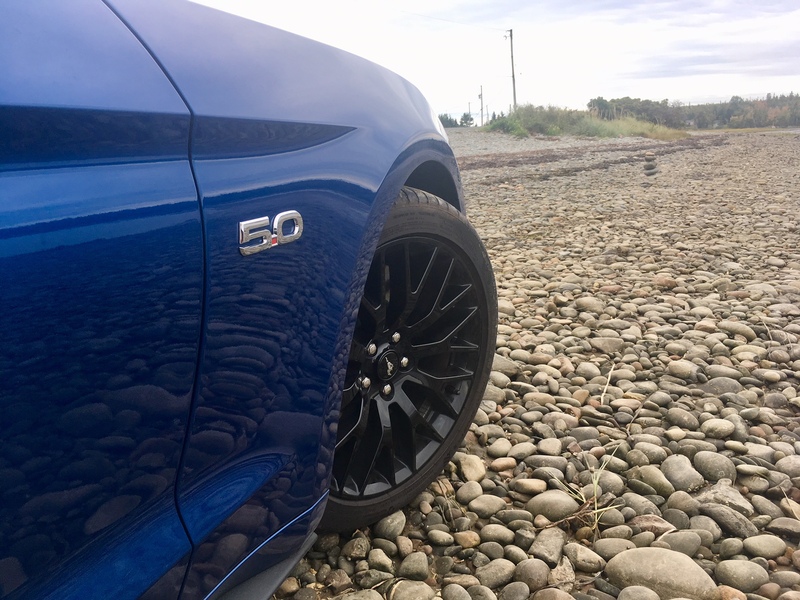 It adds rather nice looking 19-inch wheels along with, among other things, Brembo brake calipers with larger rotors, a tasteful rear spoiler, and larger radiator. Alright let’s not waste anymore time, let’s get to what you really want to know about: performance. 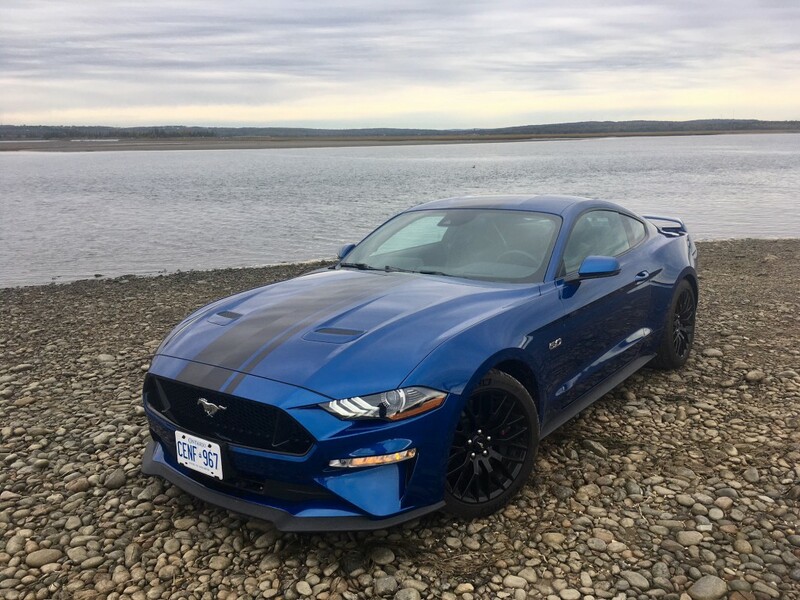 The GT comes with Ford’s 5.0 litre V8 which is good for a healthy 460 horsepower and 420 pound foot torque. As mentioned, this brute of an engine can be married to a six-speed manual or a new 10-speed automatic. The amount of sheer power generated from this engine is impressive but perhaps more so is the manner in which that power gets used. 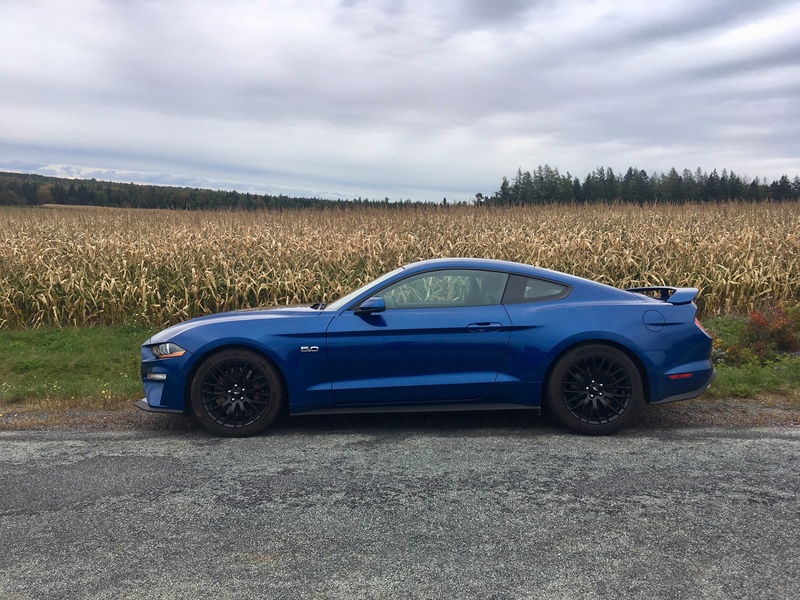 The Mustang GT actually gets a 7,300 RPM redline. Most high revving units are found in turbocharged four-pots such as the the previous generations Honda Civic Si. Those types of cars demand to be driven hard as most of the power is in the top end. But the Mustang GT has power throughout any part of the power band all the way up to 7,300. I can only imagine what the size of my grin would be had I had a Mustang GT equipped with a manual transmission, especially considering how often I was smiling with the automatic. Ten gears may seem like overkill, but when left to its own devices, the transmission responds well. It doesn’t seem to spend much time guessing which gear it should be in. It also helps to tame the beast if need be. For instance, driving the Mustang GT around town could be described as a civilized experience, believe it or not. It will skip gears to ensure a more refined, less jerky experience. When you’re in the mood for some, er, more spirited driving, the transmission because responsive and exudes a fair amount of confidence to the driver. With only a hair of lag between gear shifts, the transmission is happy to cycle through to the next gear right on command. Being a muscle car, straight line performance is exactly where it should be and it is absolutely exhilarating. There aren’t too many words that capture the experience other than that, especially when considering this massive beast can get to 100 from 0 in under four seconds, when equipped with the automatic. My tester featured an optional active valve exhaust system which essentially puts a microphone in front of a growling lion. The noise coming from the pipes is intoxicating and really helps to get testosterone pumping through your blood. It sounds mean upon start up, so much so that Ford has equipped it with a feature which allows you to dull the sound upon start up so that you don’t startle your neighbours awake from a good sleep first thing in the morning. Being a pony car, donuts and burn outs are about as easy as pouring yourself a glass of milk. Uh, I mean, that’s what I hear anyway. But what about when that long straight road becomes twisty? Given the Mustang’s mass, you would think it to be bulky, cumbersome and difficult to control. Well that optional performance package also adds TORSEN differential, a bigger rear sway bar, K-brace, heavy duty front springs, along with unique stability control and chasis tuning. The end result is a whale that moves about more like a seal. It feels quite composed and exudes plenty of confidence to the driver. It’s an impressive feat to be sure. 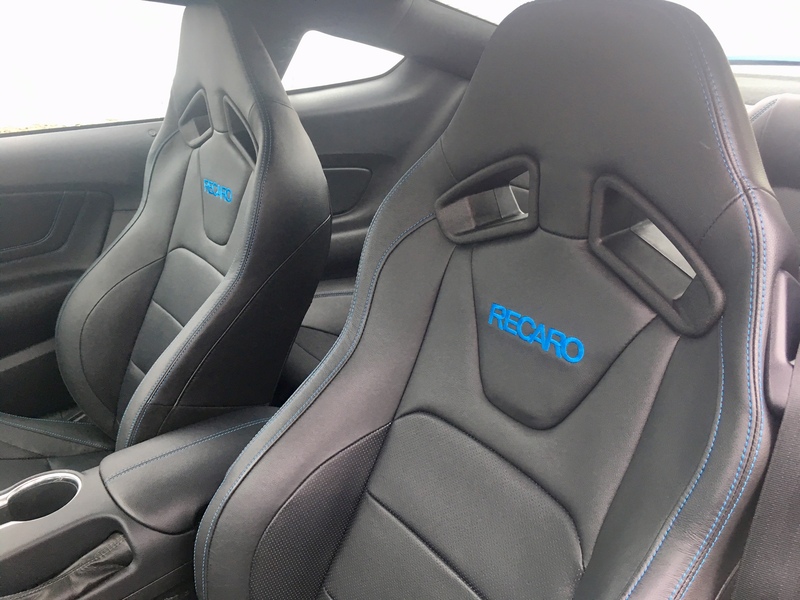 The optional Recaro seats did a great job of keeping my 6-foot frame planted too. Still, you can get the tail out and it’s fairly manageable. It’s wide stance helps it feel more planted and the added on performance bits keep you from second guessing your speed while approaching a corner. Of course, the Mustang GT has a sport, sport + and even a race track mode. 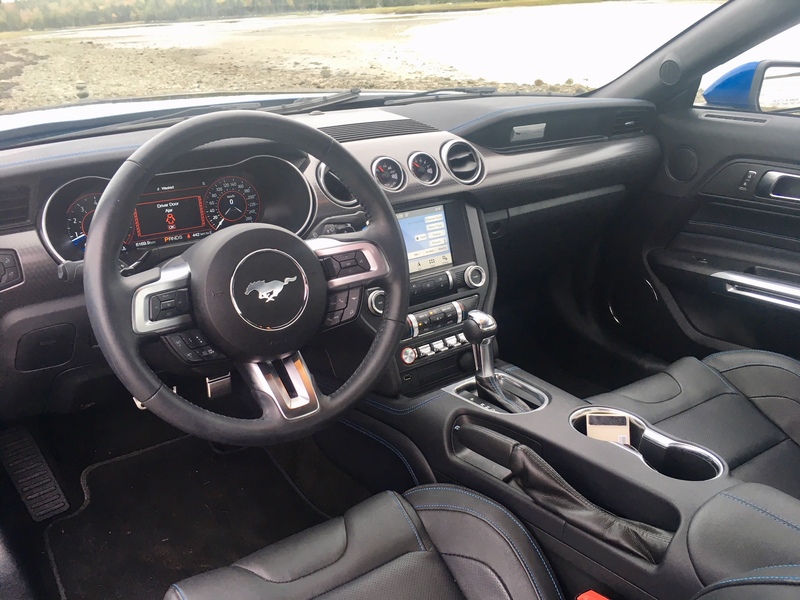 When selecting the latter, the LCD screen switches to a race-car like set up, and of course, changes the Mustang’s behaviour making it more eager than a pitbull chasing a rabbit. Is it practical? No. The trunk may be a decent size but the opening is small and awkward making it difficult to haul larger items. Can it seat a lot of people? No. The rear seats are about as useless as a pair of sunglasses during an eclipse. Is it good on gas? No. But who cares? If you want to save gas, a Prius is always waiting to impress you. Is it comfortable? Not really. 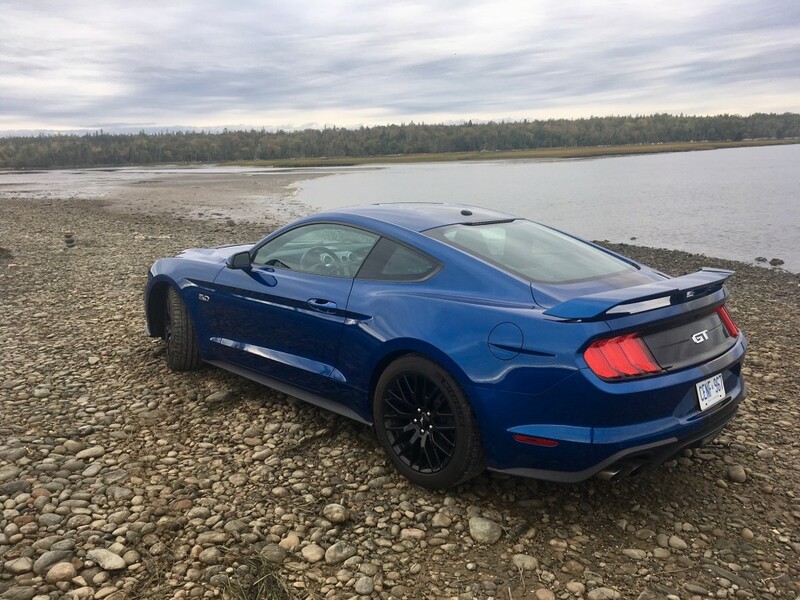 It doesn’t feel as if you’re staying on a bed of nails, but your chiropractor may have a few concerns when you tell her you traded your sensible sedan for a GT Mustang. There are a lot of things this car doesn’t do well, but none of that matters. This is a car that makes old people feel young. It scratches the itch for young people constantly looking for thrills. 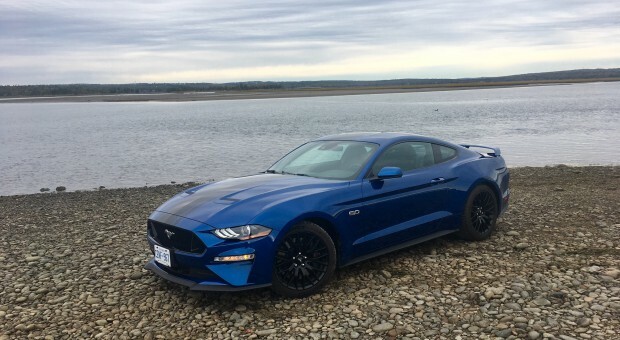 It can actually outperform a lot of its competition and I can think of no vehicle that gives you as much power, dollar for dollar, as the Mustang GT does. I’ve never been much of a muscle car guy, I’ve always preferred the performance offerings from Europe. They were, by every measurable sense, better than the Challengers, Camaros and Mustangs. But with this new Mustang I’m no longer certain that’s true. It wouldn’t surprise me in the slightest if a Mustang GT or Bullitt could hang with a BMW M4. Is it enough to make me want to buy one over an M4? I’m now unsure. Five years ago you wouldn’t be able to convince me that a Mustang was as good (when strictly talking performance at least). But now, I can safely say that the Mustang is – at least – the best of all the muscle cars available today. 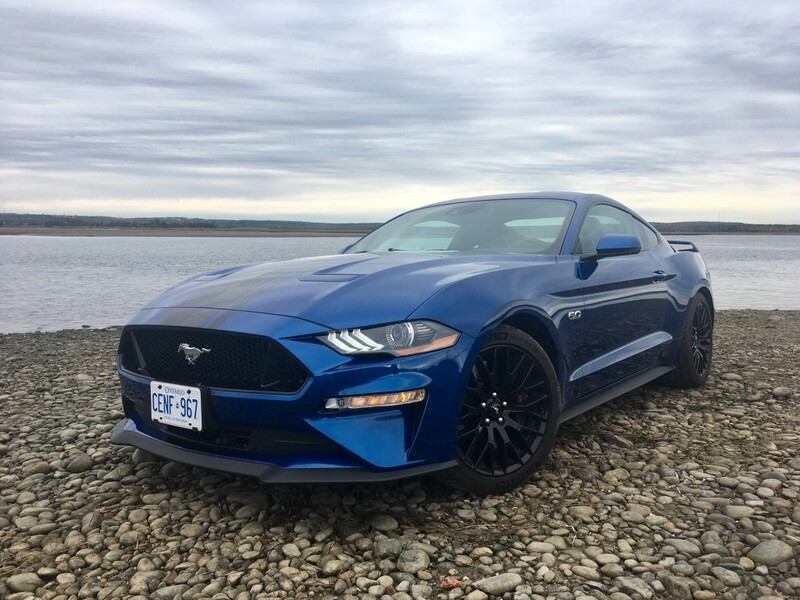 This new version is certainly the most capable Mustang ever made, and that’s something I can say with absolute confidence. 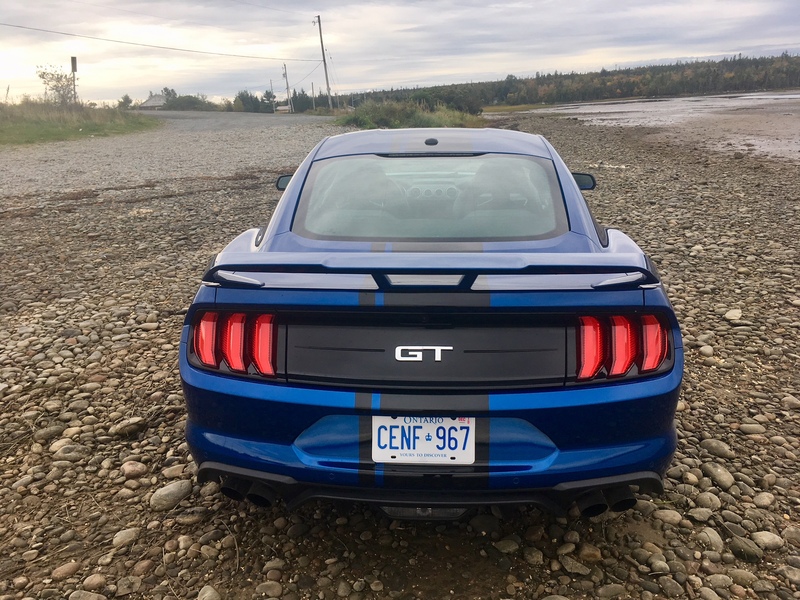 Even before writing this review, I found myself spec’ing out a Mustang GT to my personal liking. That’s something I really only used to do with the Euros and Japanese performance offerings. 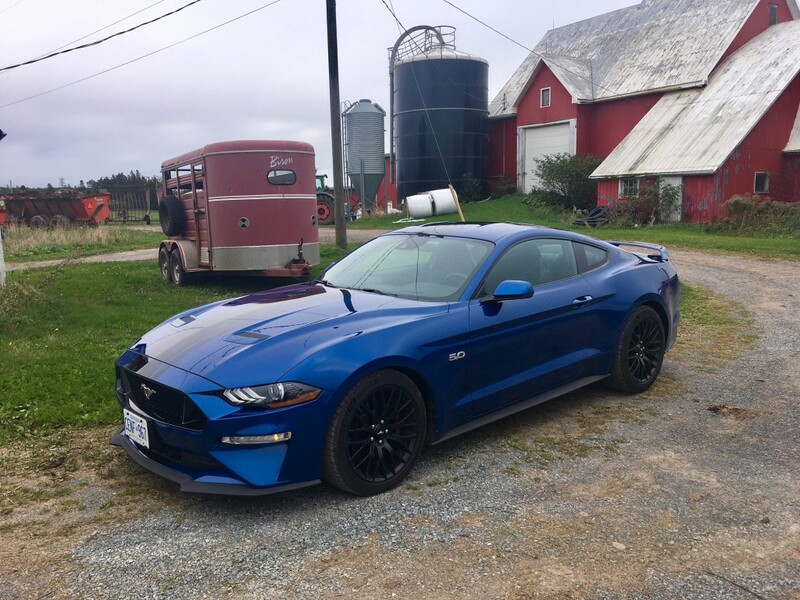 If the Mustang continues to evolve down the path its going, you may very well see a Mustang GT in my driveway yet.